India vs Australia 3rd Test Melbourne: Australian fans wanted to irritate India captain Virat Kohli again as India was taking the field on Day 3 at Melbourne. India vs Australia 3rd Test Melbourne: Australian fans wanted to irritate India captain Virat Kohli again as India was taking the field on Day 3 at Melbourne. It happened when Australia was batting, Virat was subjected to chants of ‘you are a w*****r’ from Bay 13 at the MCG, according to media reports. Kohli, who has matured over the years did not get irritated as he gave a classical reply to them. It seems such hostile reactions from the Australians have stopped bothering the India captain. In the past as well, Kohli has faced the heat from the Australian crowd, who have booed him for his aggressive nature on-the-field. But, this time he gave a classy reply to the fans to shut them. Kohli doffed his cap and acknowledged whatever came his way. In the past, Kohli had shown the middle finger to the crowds in Australia in 2012, but not this time, just shows he has matured over a period of time. 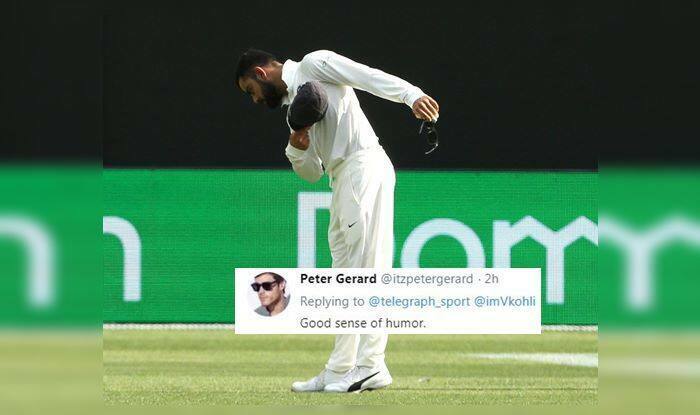 Fans were happy to see Kohli react in this fashion as they took to Twitter to applaud his gesture, except one fan. Kohli was among the runs in the first innings at Melbourne where he scored a brilliant 82 and stitched a crucial 170-run stand with Cheteshwar Pujara to put India in the driver’s seat. At the time of filing the copy, Australia was reeling at 121/6 with Cummins and Paine at the wicket.